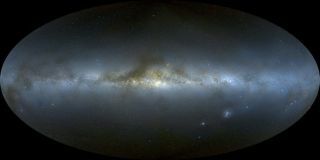 A newfound stretch of the Milky Way reveals that our galaxy's distant rim is warped like the edge of a sombrero, and that our galaxy may be far more symmetrical than previously thought, scientists say. Now scientists have more evidence supporting this two-armed structure, but they add a twist to this idea, literally. They suggest the Scutum-Centaurus Arm has a bend to it, warping the edges of the Milky Way. Radio astronomers Thomas Dame and Patrick Thaddeus at the Harvard-Smithsonian Center for Astrophysics first used existing maps of microwave radiation from the sky to follow the Scutum-Centaurus Arm past the point it had previously been analyzed. They next confirmed evidence of a stretch of gas linked with this arm on the other side of the Milky Way using the 1.2-meter telescope at their center. "This was quite an unanticipated new feature of the galaxy," Thaddeus told SPACE.com. "No one predicted that it existed. One can now trace the Scutum-Centaurus Arm nearly 360 degrees around the galactic system." This newfound extension reaches an average of about 68,500 light-years away, with the molecular gas there the most distant yet detected in the Milky Way. The fact this new stretch of gas lies slightly outside the plane of the rest of the galaxy explains why astronomers didn't see it clearly before. "The galaxy is very flat, but like a Mexican hat, at the edges, it's a bit warped by a few degrees," Thaddeus said. This stretch of gas makes the Scutum-Centaurus Arm a symmetrical counterpart of the Perseus Arm, meaning the Milky Way is similar to galaxies such as the Great Barred Spiral about 61 million light-years away. "This tells us the Milky Way is much more symmetrical than we had any reason to believe," Thaddeus said. The scientists will detail their findings in a paper accepted by the journal Astrophysical Journal Letters.